Designed by skilled artisans in some of the best workshops across Italy and the Far East, Ricci Argentieri is one of the world’s most coveted lines of flatware. 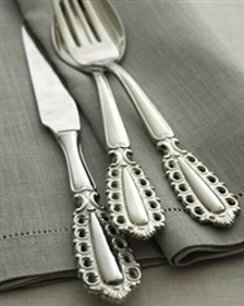 The perfect cutlery for a bridal registry or wedding anniversary, Ricci flatware stands out above other tableware brands because of the beauty, quality and history evident through each gorgeous detail on the pieces. Hold a piece of Ricci silverware and you’ll see flawless designs and unique details hand-crafted onto each piece in the Ricci Argentieri collection individually. The timeless beauty is made possible by the Ricci craftsmen, who are experts in the art and work relentlessly to ensure perfection in each piece. It’s awe-inspiring beauty has made it favorite with brides-to-be, but it is the incomparable quality of the Ricci Argentieri line that keeps generations of families staying with the Ricci name. It's also a favorite gift among mothers to their daughters - commemorating their transition into womanhood with a gift that they can cherish for years to come and perhaps even pass down to their own daughters someday. Ricci artisans employ heavily weighted .925 sterling silver in the Sterling Silver Ricci silverware. Stainless steel Ricci flatware uses the highest quality metal combination to produce stunning and durable pieces that will last beautifully through generations. Every piece of Ricci Argentieri flatware undergoes a detailed inspection, and not a single piece is released without meeting the rigorous standards set forth more than 170 years ago when the Ricci family first developed their tableware line. Yet another reason Ricci silverware is sought out worldwide is because their long-standing history of quality and beauty. In 1840 small town northern Italy, the Ricci silversmiths, a collection of highly skilled craftsmen, joined together to establish the Ricci Argentieri Guild House. Since the inception decades ago, Ricci Argentieri artisans continue to deliver the same high standard and flawless silverware as the founding silversmiths. For whatever reason speaks to you – whether it’s the remarkable beauty of each piece, the excellence in quality and craftsmanship or the deep-rooted history of the Ricci Guild – confidently choose Ricci flatware for your bridal registry or special occasion. About the Author: Edward Cain is the co-owner of Chelsea at the Grove, a high end boutique located in the heart of picturesque Monmouth County in Shrewsbury, New Jersey. Chelsea at the Grove proudly features the world-famous home décor from Mackenzie Childs’ designs as well as the Ralph Lauren Home Collection, complete with timeless Ralph Lauren photo frames and barware.